Apple on Tuesday was granted a patent for a new type of camera that could capture images at indirect angles— a concept that the company says could be used to enable projected, virtual keyboards on any flat surface. In the newly awarded invention, published by the U.S. Patent and Trademark Office, Apple states that electronic devices often have front and rear cameras, but that these cameras are normally fixed in a direction perpendicular to the surface they're embedded in. This makes them impractical for recording some subjects. The iPhone maker's proposed solution, a patent entitled "Camera Accessory for Angled Camera Viewing," would use a system of reflectors to bounce light into the camera lens, and might attach via methods like magnets, clamps, a suction cup, or even removable adhesive. Apple also suggests the possibility of using rotational mechanisms or fiber bundles in the accessory's construction. Apple further offers the possibility of using a stand. Significantly, a featured diagram depicts an iPad-sized device sitting in a dock that can image both a person's face and their hands, the latter for detecting input from a person's fingers, for instance when typing on a projected virtual keyboard. Apple originally applied for the patent in September of 2012. It is credited to a single inventor, Nicholas G.L. Merz, and is officially identified as U.S. Patent No. 9,154,677. The invention isn't the only interest Apple has shown in virtual keyboard and input methods. 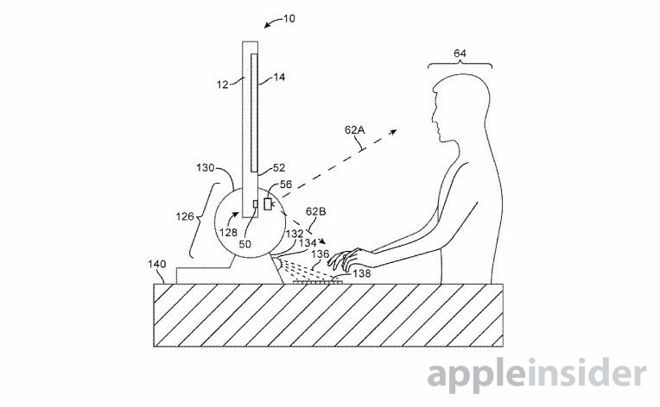 AppleInsider also detailed another patent earlier this year that would use a 3D camera system to allow users to type in the air, without the need for a surface to place their fingertips. Apple's interest in virtual input methods led the company to acquire Israeli 3D sensor firm PrimeSense in 2013. Though PrimeSense technology has yet to appear in any Apple products in obvious ways, the company's creations are perhaps most famous for powering the first-generation Kinect sensor for Microsoft's Xbox 360.